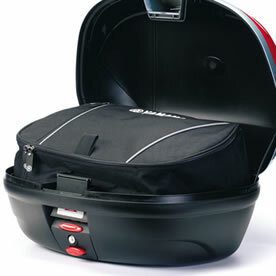 Our FJR1300 Top case inner bag holds 39 litres and is custom made to fit in the 39L rear top case. This sculpted polyester bag makes motorcycle luggage packing easy. Features easy carrying shoulder strap, two zip tabs, reflective piping, Yamaha logo and additional zipped pocket.